Here in the U.S. we are fortunate to have access to incredible variety and choice when it comes to the food we eat. We also have many opportunities to make fast and poor food choices that have led to a decline in public health. When it comes to diet and weight loss, we are often presented with so much conflicting information, it’s hard to know which dietary advice to follow. This is where Chinese Medicine and Eastern Dietary Therapy can be helpful. As with all things in Chinese Medicine, each body is individual and has its own set of needs. The approach to food is individualized, but still adheres to traditional wisdom and long-held knowledge that can optimize the body’s metabolism and cultivate health. Recently there has been a shift toward raw food diets, following the logic that cooking food breaks down nutrients so that not as many are available to the body. The trouble with this idea is that the body does not have access to all of those nutrients if the food isn’t brought to a temperature that starts to break down its cell walls. Chinese Medicine has held for centuries that raw food taxes the stomach gi; an idea that has been validated by Western Medicine after the discovery that digestive enzymes can only perform at body temperature. By cooking your food, you nurture the needs of your digestive enzymes and break down the cell walls in food to gain access to it’s nutrients. Food is the raw material that builds our blood and body tissue. By eating food that’s fresh, vibrant and pleasing to eat, you’re giving your body nourishment that will create more strength and vitality in the tissues of your body. I mean this statement in two important ways: One is that a healthy and efficient metabolism is critical for the treatment of internal disorders. Without a healthy gut, other ailments will take longer to heal and improve. The second is that the nature and temperature of foods can help or hurt the body’s healing process. 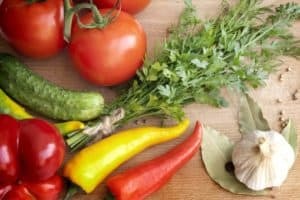 There have been many times that I’ve seen patients reduce or eliminate ailments such as hot flashes and painful joints just by adding or eliminating certain foods from their diet. Stress and negative emotion inhibit the movement of food and fluid. As impossible as it seems with a busy lifestyle, taking the time to eat and enjoy your food in a relaxed state makes a huge difference in your body’s ability to process the food you’re providing for it. The healthiest diet can’t make the same impact if it isn’t being absorbed and utilized efficiently, and for that the body needs to be relaxed. People eat for many reasons besides hunger. We eat when we’re bored. We eat when we’re stressed. Often we eat when we’re sad. We also eat socially, creating traditions around eating certain foods at certain times. Food serves more than just a physiological function. It’s easy to overeat, and in certain situations it’s not negative or harmful (I’m looking at you, Thanksgiving). Chronic overeating is a bit of a problem, though, because it can create an obstruction in the body that will negatively effect the circulation of blood and fluids and lead to other internal health issues. Similarly, under-eating (or fad diets) can cause long-term issues by damaging the body’s ability to build the tissues and materials that it needs to function optimally, leading to a variety of painful symptoms that may seem unrelated. Building a healthy gut is all about balance and consistency. Setting a few guidelines for yourself while allowing for some flexibility can make a big difference in your overall well-being.